Join us as we discover the glorious white beach of Las Bachas, Santiago Island (Buccaneer Cove and Puerto Egas), Rabida, Bartolome Island, and the sunken crater of Genovesa Island, Galapagos’ best natural aviary. End the trip on a high note watching Galapagos giant tortoises stroll through their natural habitat in the highlands of Santa Cruz Island before heading to the airport at Baltra. This comprehensive journey, starting and ending in Baltra, takes us to the oldest islands in the Archipelago. We visit the sea lions of Mosquera Islet before heading to see the red-footed boobies in San Cristobal, the island where Darwin first set foot in the Galapagos. 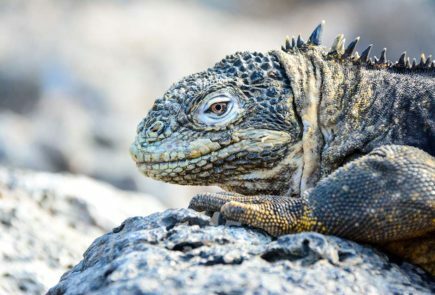 Meet the endemic land iguanas of Santa Fe, observe the colours of South Plaza, and stop in at the world-famous Charles Darwin Research Station on Santa Cruz, before heading on to top-rated Española and North Seymour, with an in-between stop at Eden Islet. Our journey begins at Dragon Hill on Santa Cruz Island, home to Galapagos land iguanas. The next day is spent at Isabela Island (Punta Vicente Roca) and Fernandina Island, the pristine jewel of the national park. From there, we are on to the world-famous Charles Darwin Research Station and its captive tortoise breeding program. Floreana Island’s Post Office Bay and Punta Cormorant round off the trip with insights into human presence on the islands. I’m planning on booking another trip on the Santa Cruz II to the Galapagos. Can you look up which tour I went on two years ago with my wife Pamela Miele? We are so happy to hear from you again! We’ve checked our database in order to give you the information you requested. You traveled with us in March 2017 aboard the Santa Cruz II and did an older version of our 6D/5N Western islands itinerary. We would strongly recommend you take our 7D/6N Eastern Islands Itinerary so you can continue to explore the wonders of the archipelago. Would you like us to put you in touch with one of our destination experts? We’ll be waiting for your response.